We are a leading Manufacturer of high tensile alloy fasteners, alloy fastener and alloy steel fasteners from Mumbai, India. 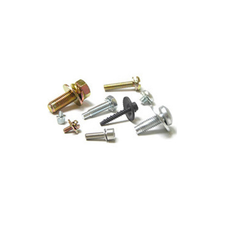 We are engaged in offering a wide range of High Tensile Alloy Fasteners such as studs, hex head bolts, square hex head, foundation bolts, jack screws, jack bolts and hex heavy series nuts. 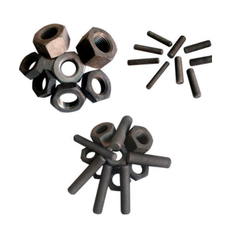 These fasteners are manufactured utilizing alloy, stainless and carbon steel material of various grades as per the sizes and specifications according to ASTM A 193 GR. B7/L7/B7M/B8/B16 ASTM A 194 GR. 2H/2HM/4/7. Furthermore, we have all the necessary gauges and tools available for maintaining the sizes and the quality of the material. We have a good capacity of producing goods for more than 80 mt per month. This material is considered suitable for bolts to be used at the temperature below 450ºC, with a minimum effect on its structural strength during application at a high temperature. The material has the following chemical composition and physical properties. Alloy Fastener is considered suitable for bolts to be used at the temperature below 450ºC, within minimum effect on its structural strength during application at a high temperature. The material has the following chemical composition and physical properties, standard ASTM A193 B7. Dia Minimum Tempering Temperature Tensile Strength min Ksi Yield Strength min. 0.2% offset Ksi Elongation in 2" min.% Reduction of area min.% Hardness Max. We Reliable Polymer Industries Manufacturer, Export and suppliers of Alloy steel fasteners, we present our supreme quality range. Made in compliance with international standards of quality and safety, these fasteners are available in varied grades and specifications to suit the demand and requirements of end buyers. These fasteners are highly praised in Indian as well as the overseas market for their attributes of durability, corrosion resistance, reliability in service and sturdy construction. ASTM / ASME A 193 B 6, B 7/ B 7M, B 16// ASTM / ASME A 194 GR. 2, 2HM, 2H, GR 6, B 7, B 7M.